In developing our ASI Rare Coin Program (RCP), we discovered that many of you have already dabbled in 'rare coins' with disappointing results. After listening to your needs, we decided to create a makeover service to transform your underperforming portfolios, many of them a 'thorn in your side,' into a solid rare coin portfolio designed to meet your original goals. You can learn exactly how our RCP works in my article, You Can Turn a Loss into a Gain with One Phone Call. While we at ASI are happy to sell your coins for you even if you do not want to rebuild your portfolio, we have discovered that our clients who do opt to replace their rare coins with truly rare coins, hand-selected by our outstanding expert, Douglas Winter, get back on the right track immediately. We encourage you to become part of the growing community who are protecting their portfolios with rare coins. The Knight Frank Rare Coin Index has seen an average gain of 11% annually over the past 40 years. Rare coins have outperformed the stock market over that time. In the last 10 years, outside of classic cars, it is the top earning collectible asset class. Unlike cars, you don't have to build a new garage to store them, and they are much more affordable to new investors. Rare coins have been a consistent performer and have shown over a 225% increase in the past decade. 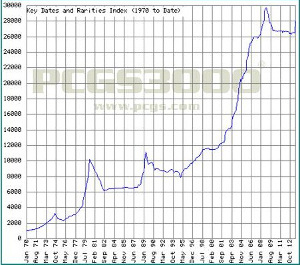 The Professional Coin Grading Service (PCGS) statistics clearly demonstrate this trend. Because our Rare Coin Program is individually designed for you, it may be difficult for you to envision how you would transform your ailing portfolio into a money maker. So, as a way of illustration, and with the permission of one of our RCP clients, we can show you a real life example of what happened when we were given the leeway to makeover a portfolio. We sourced this collection out to some of the top suppliers in the country to get the highest quote we could possibly offer our client given his substantial loss. This is the best case scenario on his buyback, because what is even more troubling is the company they bought the coins from would only buy one of the coins back! As you can see our client lost a ton of money on these coins. For an initial investment of $55,903.60, this client currently has a value of $12,800. That's a loss of more than 75%! This is not a case of "the market went down" or "you need to give the investment more time." I know how you are feeling after reading about that type of loss and I don't blame you, but I had to tell him! However, there is better news ahead. Why did the portfolio do so badly? In a few cases like the 1852-C $1 Liberty, he just overpaid and was not savvy. But in most of the cases, as with all the first strikes, he was confused by what a true rarity is and what is merely marketed in limited editions to seem rare. For a full discussion of the tricks of the trade that you must shun and why many of us mistake limited minting for true rarity, read my article Rare Coin Myths That Lose You Money. Before we go any further, I want to introduce you to our rare coin expert, Douglas Winter. Doug is considered the leading expert on pre-1933 rare U.S. gold coins. Check out my article, Eyes Wide Open: Waking Up to the Power of Rare Coins for a robust list of Doug's credentials, including his 13 books. Your ASI Rare Coin Portfolio is hand-selected by Doug for you. We want you to be fully familiar with him if you plan a transformation of your coin portfolio. Your understanding of what an expert can bring to the table will make all the difference in your decision to properly add the uncorrelated asset class of rare coins to your portfolio. After our client decided to makeover his portfolio, we talked to him about his original goals for the buying of rare coins. He expressed the desire to leave a long term legacy. With that information and more details about his diversification in other rarities, we were ready to set Doug on a mission to search for coins that were right for our client and create a handpicked portfolio. The portfolio is now transformed from a coin collection base on manufactured limited quantity, to a rare coin collection based on true rarity and value. Whether you want to buy, sell or become further educated, call ASI, and one of our Preferred Client Relations representatives will guide you through. By all means, ask for me directly, and we can make a special appointment. Above all, do not keep your coins languishing in an ailing portfolio; take them out for a spring makeover.